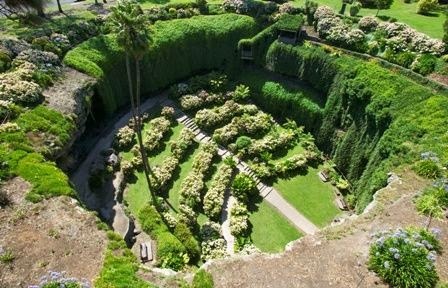 Thousands of years ago, Umpherston Sinkhole, also known as The Sunken Garden was a cave. Water eventually dissolved enough of the limestone to cause the ceiling of the cave chamber to collapse creating a large open pit know as a sinkhole. James Umpherston purchased a farm property which just so happened included this amazing sinkhole. He then went on to established this amazing garden on the floor of the open cave. Being retired and having the time James Umpherston wanted to create a pleasant garden for the people of Mt Gambier. After clearing the existing vegetation from within the sinkhole, he carved a path into the side of the rock, erected wooden steps so visitors could enter his garden. The garden was and still is filled with all kinds of ferns, shrubs and flowers. Even with quite a few other visitors in the sinkhole, sitting down in the bottom of this amazing creation is extremely peaceful.